Specifically designed for black powder hunters. Designed around the needs of rimfire and muzzleloader hunters. A wide field of view, excellent brightness and the ruggedness to shrug off the heavy recoil of slug and black powder rifles define the R/M. Parallax is adjusted for 50 yards and is perfectly suited to the close-range action of hunting and shooting with rimfire rifles, muzzleloaders and shotguns. Scope Turret Adjustment: .25" @ 100 yds. Field of View: 33.9' - 11' @ 100 yds. This scope is amazing. The clarity, finish and mechanics are great. The only thing I can compare it to is the Zeiss conquest series. The optics are bright and awesome in all conditions. The exterior finish is hard and resists scratches. the adjustments are positive, deliberate clicks and are not mushy at all. As for durability, I mounted it on a .375H&H with no problems. 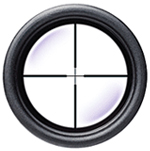 This is a great quality scope without breaking the bank. It has great low light capability and fantastic crisp image quality. I would definitely buy again and highly recommend this product.